Piper's report was packaged as bad news for Facebook, but that's a narrow analysis of the data. If it's a day that ends in "y," you can bet there's an article fearful about teenagers fleeing Facebook (NASDAQ:FB). The line of thought, which has seemingly been around since the company's widely maligned IPO, seems to border on concern trolling of late. The newest report, from analyst company Piper Jaffray (via The Wall Street Journal), appears to add more fuel to the fire. To be fair, it isn't as if these concerns aren't valid -- nor is this an attack on Piper Jaffray, as I personally consider the company to be highly knowledgeable in analyzing technology companies. As for the concerns, Facebook's ad-based business monetization model consists of growing time on the service through a combination of increased users and/or increased time per user spent on the service during which to deliver advertisements. As such, any decrease of users -- especially marketer-desired teenagers -- has the potential to hurt Facebook's future top-line growth. As you can see, even if Facebook is experiencing decreased time share from teenagers, it's not stopping the stock from its tremendous run, nor is it stopping the company from growing its top line. 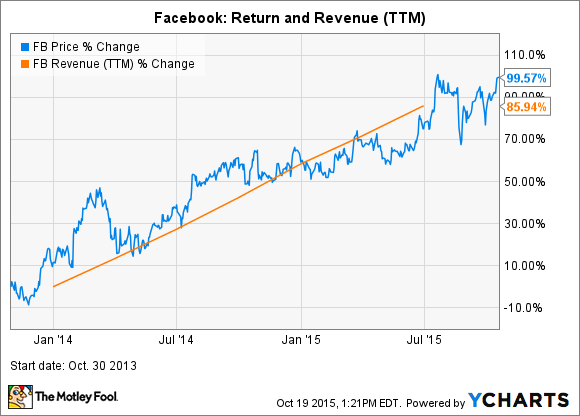 Furthermore, I think Piper Jaffray's report is good news for Facebook, not bad, like the Journal suggests. Does Piper Jaffray's data even matter from a monetization standpoint? According to Piper Jaffray's semiannual teen survey, one-third of respondents rated Instagram as their "most important" social network, followed by Twitter (NYSE:TWTR) with 20%, and 19% of teenagers choosing privately owned Snapchat. Facebook trailed these other social-media outlets by reporting 15%. While on the surface, this appears to be bad news for Facebook, there are a few reasons investors shouldn't be concerned. First, there's a difference between "most important" and most used. Admittedly, there's probably a lot of overlap between the two, but Facebook's near 1.5 billion monthly active users -- up 13% year over year -- promotes a tremendous built-in network effect competitive advantage, meaning it's almost impossible to ignore using the site. Facebook may be "less cool," but it appears to be on the verge of becoming essential, which is even more important from a monetization standpoint. Next, the data is correct, but packaged in a way to make it slightly misleading for investors. As it's been widely reported, Facebook purchased Instagram in 2012 for $1 billion. Therefore, perhaps the best way to present Piper Jaffray's data is: "Facebook-owned sites, including the photo-sharing site Instagram, are now considered teens' 'most important' social networks by nearly half of respondents, followed by Twitter with 20%." In the eyes of many analysts, Instagram is still underutilized from an advertisement standpoint, but Facebook is looking to ramp up advertising on the platform, according to COO Sheryl Sandberg during the second-quarter conference call. In the end, Instagram could be leading the next leg up as far as Facebook's revenue growth is concerned, and it shouldn't be viewed as a competitor with the namesake site, but as a strong complement.